LONDON — Young gun Anthony Joshua got up off the canvas to stop former champion Wladimir Klitschko Saturday in the 11th round of a heavyweight world title fight that is being hailed as an epic. In a tumultuous atmosphere at Wembley Stadium, 90,000 fans saw the undefeated 27-year-old add the World Boxing Association (WBA) title to his International Boxing Federation (IBF) belt sparked by a devastating right uppercut that led to the 41-year-old Klitschko being felled in the 11th. The Ukrainian former world champion rose unsteadily before being floored again. He bravely got up once more but referee David Fields waved it off soon after as he was unable to defend himself against a barrage of Joshua blows on the ropes. American Boxing legend Sugar Ray Leonard was among those who immediately hailed the contest as ’amazing’. "Such an amazing fight with 2 great fighters. Lot of heart by both fighters. A lot of questions answered by @anthonyfjoshua #JoshuaKlitchsko," he tweeted. Lennox Lewis paid tribute to Klitschko for getting up twice in the 11th from devastating Joshua punches. "How much heart did @Klitschko show in this fight? Gotta respect it. Hold ur head high brother! #joshuaklitschko." tweeted the Briton who was the last man to be the undisputed world heavyweight champion. The Ukrainian had also been sent crashing to the floor in the fifth round as the 27-year-old British fighter took his perfect record to 19 stoppage wins in 19 fights. "What can I say? 19-0, three and a half years in the game. As I said, I’m not perfect but I’m trying and if you don’t take part you’re going to fail," said Joshua who was put on the canvas for the first time in his career in the sixth round of the see-saw battle. "As boxing states, you leave your ego at the door and you respect your opponent. So a massive shout out to Wladimir Klitschko," said Joshua. A third defence of his IBF world heavyweight title also earned Joshua the vacant WBA belt as he became the first British heavyweight since Lewis in 2002 to hold two versions of the world title. It was Klitschko’s first stoppage defeat since Lamon Brewster beat him in 2004 and leaves his record at 64 wins and five defeats. "The best man won tonight and it’s a massive event for boxing," Klitschko said. "Two gentleman fought each other. Anthony was better today. It’s really sad I didn’t make it tonight." Klitschko was trying to reclaim two of the three belts he lost to Joshua’s fellow Briton Tyson Fury by an upset on points in November 2015. The Ukrainian had not fought since then and entered the ring as the underdog in front of Britain’s largest boxing attendance since 1939. Klitschko could not establish his jab in the first round and it was Joshua who landed more punches, with the best being a left hook in the opening minute. 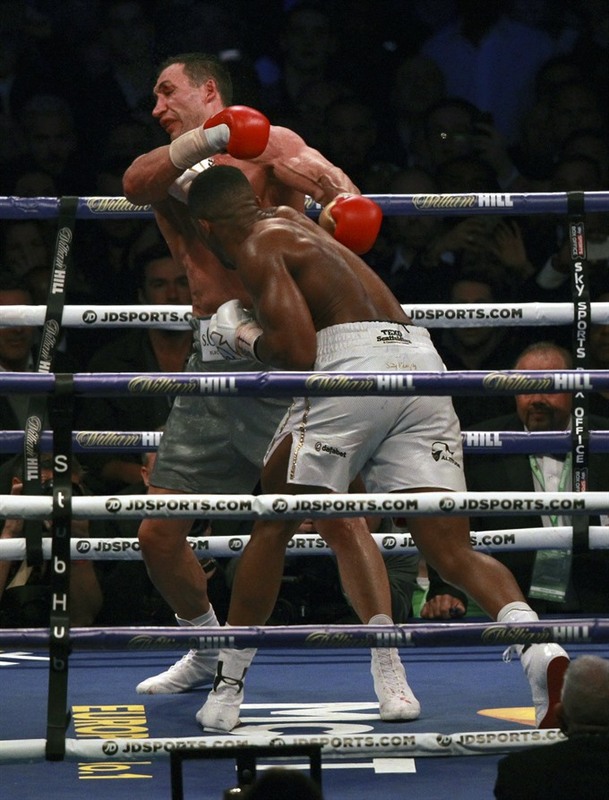 Joshua began the second confidently and repeatedly found Klitschko with his jab. The Briton missed with a big overhand right at the start of the third round but then connected with a sledgehammer left hand. Klitschko began the fourth full of intent but it was Joshua who started quicker in a thunderous fifth round. The Briton wobbled Klitschko with a left before landing a series of clubbing blows, including a cracking right uppercut, which sent the Ukrainian to the canvas. Klitschko got up but was on unsteady legs and began swinging wildly. Joshua suddenly became static on the ropes after punching himself out. Klitschko seized his moment and began to land flush as he took control. In the sixth, Joshua’s early confidence had evaporated and he was dropped by a right hand to the temple. He was up at eight and immediately had to duck a big left from Klitschko before surviving the round. In the 11th Joshua uncorked a sweet right uppercut to snap back Klitschko’s head, followed by another right to send his opponent to the canvas. Klitschko courageously got up but was nailed by another right and another right uppercut and went down again.